A Lunch box should not only be nutritious and healthy but also tasty. Coming up with new ideas to cook different recipes for lunch every day can be quite exhausting for everyone. A good lunch is worth the effort because it will restart your day and make you as energetic and happy as ever. Lunch box should consist of wholesome nutritious recipes by making smarter food choices, by eating natural whole foods like fruits, veggies, and whole grains, limiting fat consumption, reducing processed food in the diet, and watching portion sizes. 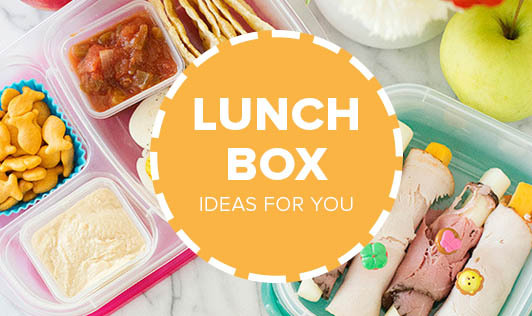 Here we are suggesting a few recipes for the lunch box to make things easier for you. This wrap is stuffed with chicken tenders and couscous with a hit of lemon and a healthy dose of fresh herbs. Save any leftovers to wrap up for an easy lunch. • Bring water to a boil in a small pan. Stir in couscous and remove from the heat. Cover and let stand for 5 minutes. Fluff with a fork. Set aside. • On the other side, combine parsley, mint, lemon juice, oil, garlic, a pinch of salt and pepper in a small bowl. • Toss chicken tenders in a medium bowl with 1 tablespoon of the parsley mixture and a pinch of salt. Place the tenders in a large nonstick frying pan and cook over medium heat until cooked through, around 3 to 5 minutes per side. Transfer to a clean cutting board. Cut into bite-size pieces when cool enough to handle. • Stir the remaining parsley mixture into the couscous along with tomato and cucumber. • To assemble wraps, spread about ¾ cup of the couscous mixture onto each wrap. Divide the chicken among the wraps. • Roll the wraps up like a burrito, tucking in the sides to hold the ingredients in. • Cut in half & serve with mixed green salad. • Combine all the ingredients in a deep bowl and knead into a soft dough using enough water. • Divide the dough into equal portions. • Roll out a portion of the dough into a circle using a little dry whole wheat flour for rolling. • Heat a non-stick tava (griddle) and cook it on a medium flame, using a little oil, till golden brown spots appear on both the sides. • Repeat steps 3 and 4 to make more parathas. • Serve with green coriander or mint chutney. Allow the parathas to cool completely, wrap in an aluminum foil, and pack in an air-tight lunch box.